Walker Filtration research, design and manufacture a comprehensive range of ammonia and refrigerant filters for use in specialist applications where the quality and cleanliness of the gas needs to be maintained to the highest level. These products are often installed within large industrial cooling systems and offer protection from the buildup of excessive amounts of oil on heat exchanger surfaces prevents the blockage of tubes, valves and expansion orifices and also maintains the overall cleanliness and capacity of the system. The filter elements are incorporated within our threaded filter housings and feature the unique Walker Filtration 'push-fit' element design. This reduces maintenance time and allows the filter to be located within the most confined places. The flanged range of filters include features such as stainless steel distribution plate and side mounted threaded connections close to the bottom of the filter vessel to facilitate the mounting of accessory products as required. 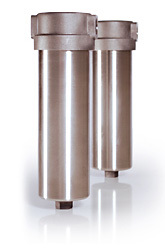 Stainless steel filter housings are available with connection sizes of ¼” to 2” with various flow rates available. Walker Filtration also offers a range of higher capacity carbon steel flanged filter products to meet your filtration requirements.